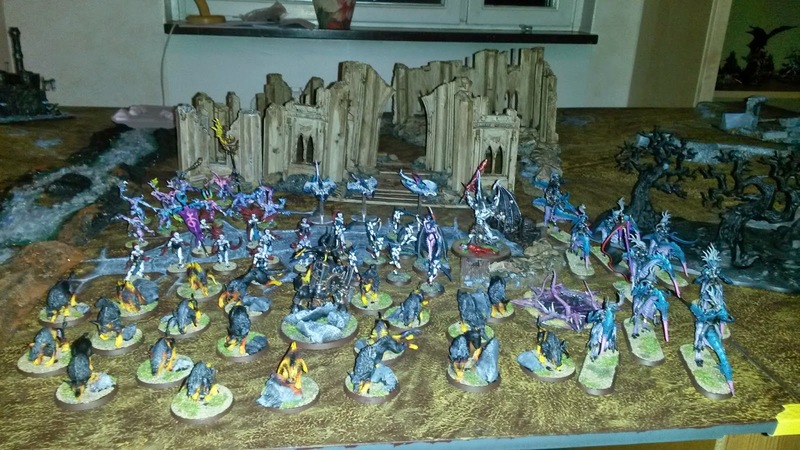 So a couple of friends (and friends of friends) are going to have a little tournament in a couple of weeks. Seems to plan is to cram in 4 game tables into my flat, which will surely be interesting. So far we're 7 players, aiming for 8. We're going for a 1500p and will be using active komp (2) (this is the guideline for anyone interested: http://sdrv.ms/1eWMbIv ) and no allies. Wasn't my idea, but I'll look at it as a challenge. We'll also be using BAO missions. Armies so far seems to be Daemons (me), Imperial Guard, Necrons, Iron Hands, Tau, Sisters of Battle(! ), Dark Eldar and another Necron army. Nice variety there! So, this komp system puts some limitations on what kind of lists we're allowed to take. Flying Circus is way out of the question. But for some reason you're given komp for multiple units of Flesh Hounds and Seekers... but one big unit is fine. So looking at my options I decided to go for that, since I have the models available as well. So one large squad of Flesh Hounds, which will be led by the Herald of Khorne who will most likely carry the Grimoire. No surprises there. I was pondering about dropping the Grimoire, and only taking a Portalglyph... but the komp specifies that if you have one Herald with a Exalted Reward that's 1 komp... taking another Exalted Reward doesn't give any extra komp, so I figures I might as well take both anyway. What to put the Portalglyph on though? I quite like the idea of the large squad of Daemonettes that has been around the blogosphere lately. So I decided to give it a try. And then the Herald to lead them makes sense, since I can't multiply this squad unfortunately. I think this squad will be able to support the Hounds nicely in a second wave as they're almost as fast. The Master Level on the Herald is basically just for points, I couldn't think of anything more useful - and I do think the Lore of Slaanesh might come in handy here. With two rolls I hope I'll be able to get Acquiescence, but I'll be quite pleased with Cacophonic Choir as well. I could go for Telepathy here, but the thing is with such a low Ld model I look at this as just a bonus... I don't want to think of this as "I need this power for it to work" and rely on Ld8. Besides, I have Be'lakor all ready to deal with that. Be'lakor. My toolbox who'll give me some flexibility. I know I'll have to be really careful with his placement... with Tau and IG on the table, both pretty gunline heavy there'll be plenty of small arms fire that will really hurt him if caught out of position. I'll really have to judge for each turn if Be'lakor or the Hounds needs the Grimoire more. Meanwhile he'll run around doing his thing wherever he's needed. I think he's the glue that holds this list together. Seekers will probably outflank I think, knowing that there'll be Manticores and static Tau I think they might be just what I need to break them up a bit. Force their deployment a bit. Thing is, whenever I've deployed Seekers they've been blasted off the board before they could do anything. So I think Outflank is the way to go with them. The Screamers will also be in Reserve, with only 3 of them I don't want to start on the board unless I have a nice piece of terrain in my deployment zone to hide behind. This unit is only there to be annoying. It can fly around, slash some vulnerable troops, pick off some artillery or such, and if I keep them alive they can contest pretty much anywhere on the board in the last turn. I really like this distraction unit... because even if my opponents shoots at them and kills them, at least they drew away some fire from my bigger threats - and the Hounds in particular will be happy if less stuff are shooting them. Anyone has any comments/suggestions for this list? Something you'd do differently (and remember to consider the komp)? I have never been a big fan of seekers as far as slotting it in for competitive play. To be honest, I would rather just have more daemonettes. 10 seekers is roughly 13 daemonettes. You can mix those two squads. Honestly, I would rather have a tzeentch herald if I was going with the portalglyph. Extremely reliable divination and tzeentch powers. The Seekers haven't really done much for me either, but unfortunately I don't own more Daemonettes. My reasoning there is that at least I get the outflank threat this way. I can't take a Tzeentch Herald without dropping Be'lakor due to the comp. And my experience with the Tzerald is it doesn't add too much - especially compared with Be'lakor.